These books—some recent, some classics—all help to clarify what shared church looks like in practice. In addition, the brief video, “The Lighthouse,” offers a whimsical parable on the power of shared church. How can church worship services be opened to congregational participation? That is the question Larry Peabody, author of Curing Sunday Spectatoritis, posed to church leaders. In the book, 25 leaders describe a variety of ways they are turning spectators into participants during congregational meetings. In this book, the Williams confront the thought-provoking dilemma: how can a New Testament model help empower and renew the church in today's post-Christian society? 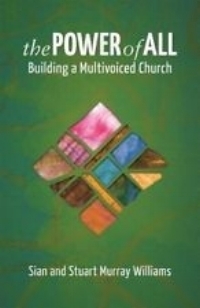 They outline the multivoiced character of the early churches--how they valued the gifts of all members of the community and expected that the Holy Spirit would speak through them. Discover the growth and opportunities that occur when we nurture the wider community's spiritual talents. Trinity in Human Community outlines aspects of both the author's personal journey and his theological explorations in the context of a particular congregation that has sought to break new ground in radical, relational, community-living. Holmes suggests a number of practical principles intended to help local congregations implement at a personal and communal level what it means to love and worship the Trinity within authentic human faith community. This provocative study goes back and looks carefully at the way preaching is understood in the New Testament and how this challenges contemporary assumptions. It concludes by suggesting ways to make preaching a genuine two-way conversation. It will be of interest to anyone concerned to let the New Testament practice shape their pastoral ministry. 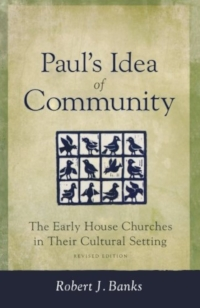 Robert Banks's widely read book, Paul's Idea of Community: The Early House Churches in Their Cultural Setting, is once again available to laypeople, pastors, and scholars alike. In this extensively revised edition Banks has rewritten chapters for clarity, taken into account recent scholarship on Paul's writings, updated and expanded the bibliography, and added an index. This new edition retains, however, all the freshness and vitality of the original. This classic book deserves frequent re-reading. From the book: "We are making a great step forward when we realize that there is no inevitable contradiction between the idea of the scattered Church and the idea of the gathered Church. We gather in order to scatter! The Church is a particular fellowship of men and women involved in common life, sharing the life of Christ, who assemble with one another for the purpose of sending." 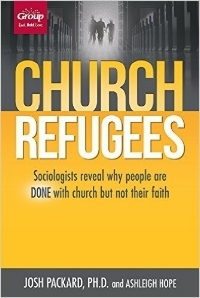 The authors interviewed nearly 100 people to learn why Christians are leaving church. They discovered "the church isn't asking too much of people; it's asking the wrong things of them." The authors say, "Churches wanting to reengage the Dones should recognize that it will be difficult, if not impossible, to get them back to church as it's currently structured." One interviewee told them, "I've always had questions for the church, but there isn't much room in Christian churches and denominations to question." Drane, Head of Practical Theology in the Department of Divinity at the University of Aberdeen, finds parallels between the famous fast-food chain and the way many contemporary churches operate. Like McDonalds, he says, churches seek to grow by pursuing efficiency, calculability, predictability, and control. He believes "the issue of power and control is at the heart of all the other factors that are at work in a McDonaldized style of being." Another classic book that never goes out of date. Halverson, a pastor, served as Chaplain of the U.S. Senate. The flyleaf of the book notes that he detected "a pious and 'very traditional' voice of the Evangelical church which claims Christ as the answer, but seems to be unaware of the question that society is asking. And his conclusion . . . caused a complete turn-around in his thinking," leading him to plead with the Church "to come around from a 'traditional' stance to a biblical one." Ray Stedman shows you how to recapture the vigor and authenticity of the early church—a radical body of enthusiastic believers who spread the Word of God throughout the world! This book—considered a classic by many—brings you challenging questions that make Body Life both personal and practical. Body Life is a groundbreaking book inspiring churches and disciples to return to New Testament Christianity. Using principles from Romans 12, 1 Corinthians 12, and Ephesians 4, Stedman helps you discover the dynamic purpose of the church and the exciting role you have to play in the body of Christ. “ (from Amazon.com description). Even if not originally intended to do so, some videos seem to serve as parables. This one from Liberty Mutual can remind us Christ-followers of our role as light of the world--not only as individuals but as Shared Church.